We are standing on Oak Ridge, looking at the McClean Farm. The light-green/light-blue water tank in the left background marks the location of Camp Letterman on Hospital Hill. 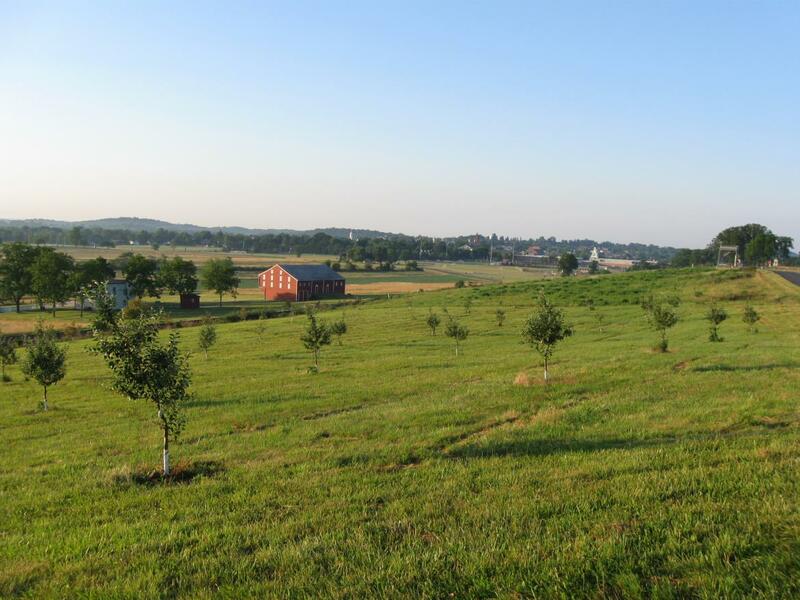 In the right background above the treeline to the left of the barn is Wolf’s Hill. This view was taken facing southeast at approximately 5:45 AM on Monday, June 21, 2010. 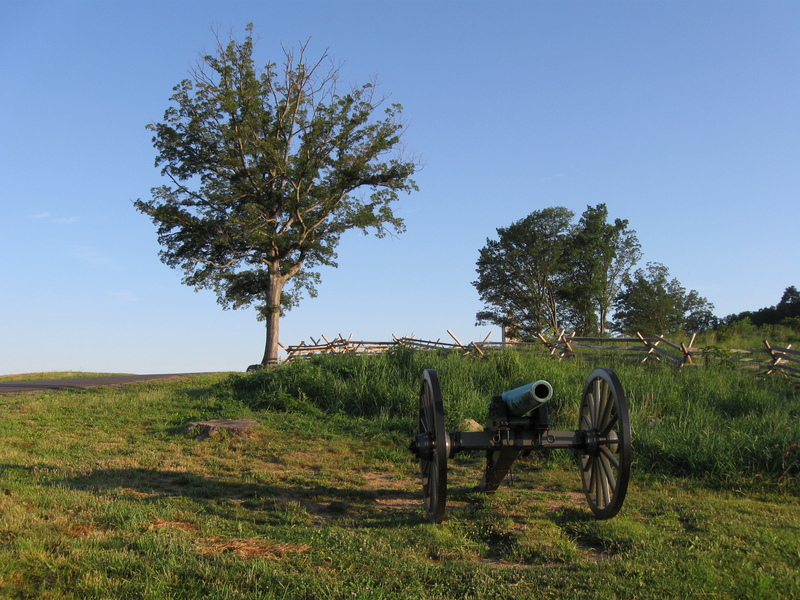 We are starting a series of summer shots around the battlefield. 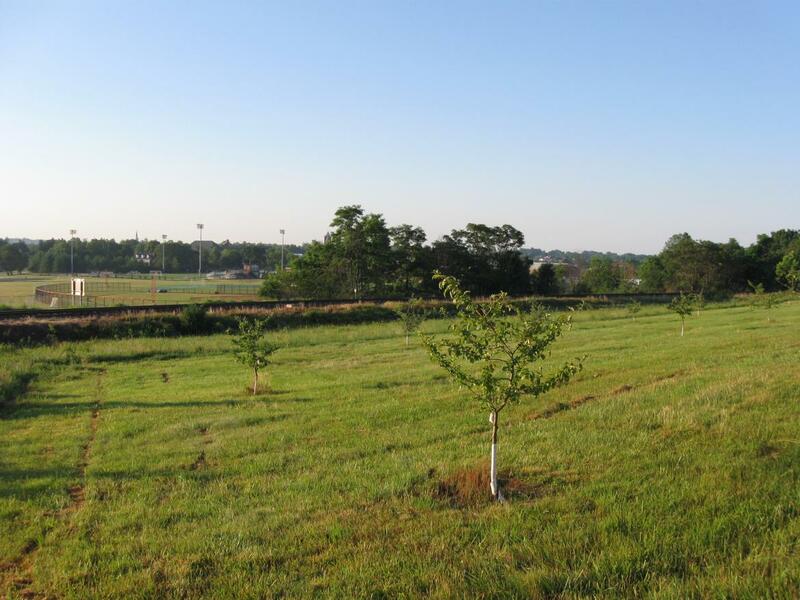 Today we will concentrate on two orchards on Oak Ridge, adjacent to the Mummasburg Road and Doubleday Avenue. 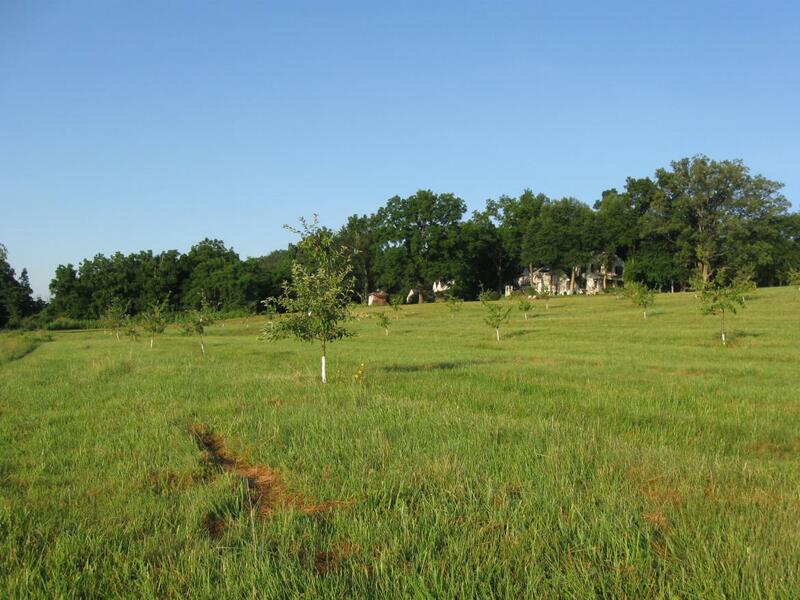 We will show you the orchard planted closest to the McClean property and the orchard planted near the line of Robinson’s division on Oak Ridge. Wolf’s Hill is in the left background. Culp’s Hill is above the barn and above the white steeple. Cemetery Hill is above the buildings in the right background of this shot. This view was taken facing southeast at approximately 5:45 AM on Monday, June 21, 2010. 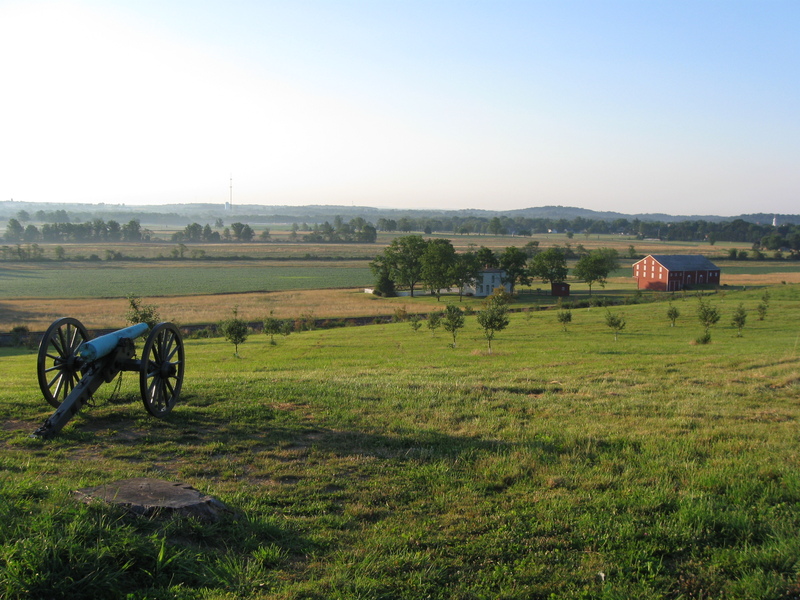 Cemetery Hill is now in the left background, behind the buildings of Gettysburg College. The Oak Ridge observation tower is in the center background. O’Neils Alabama Brigade charged in the direction of which we are facing on the afternoon of July 1st. This view was taken facing south at approximately 5:45 AM on Monday, June 21, 2010. This is Paige’s battery of Carter’s Confederate Artillery battalion. Oak Hill is in the right background. This view was taken facing northwest at approximately 5:45 AM on Monday, June 21, 2010. Remember that these 12-pounder Napoleon cannon barrels were not green at the time of the battle. 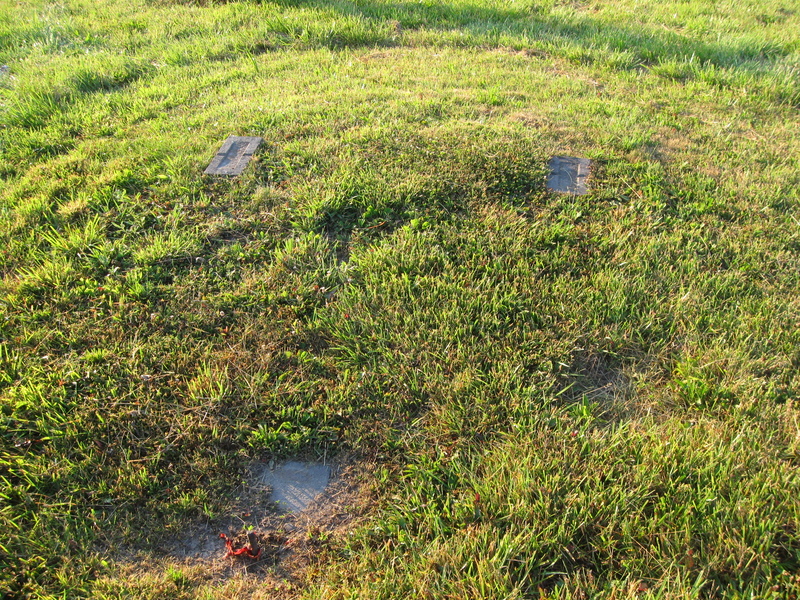 They were bronze, but have turned green over the years. This view was taken facing southeast at approximately 5:45 AM on Monday, June 21, 2010. 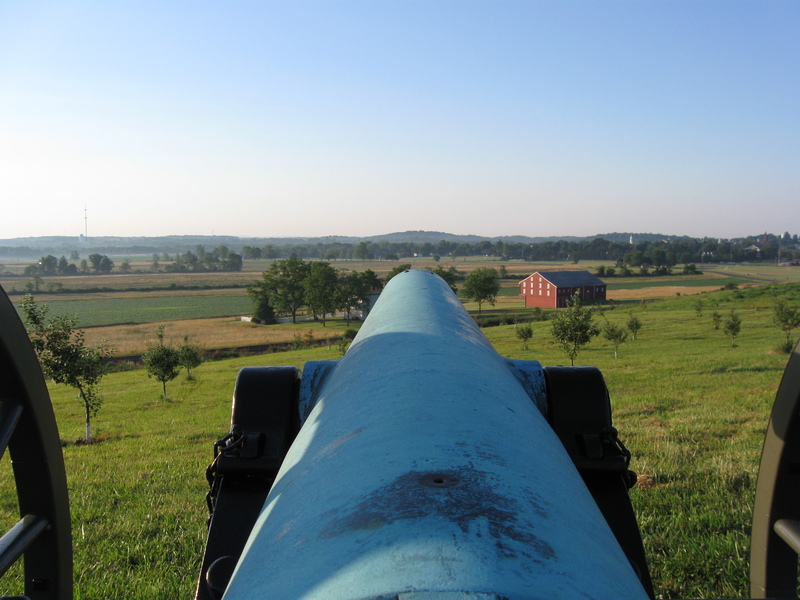 Of the eight guns that composed the two batteries that held this position on July 1st, only two are normally displayed. One of these guns is absent. This view was taken facing southeast at approximately 5:45 AM on Monday, June 21, 2010. 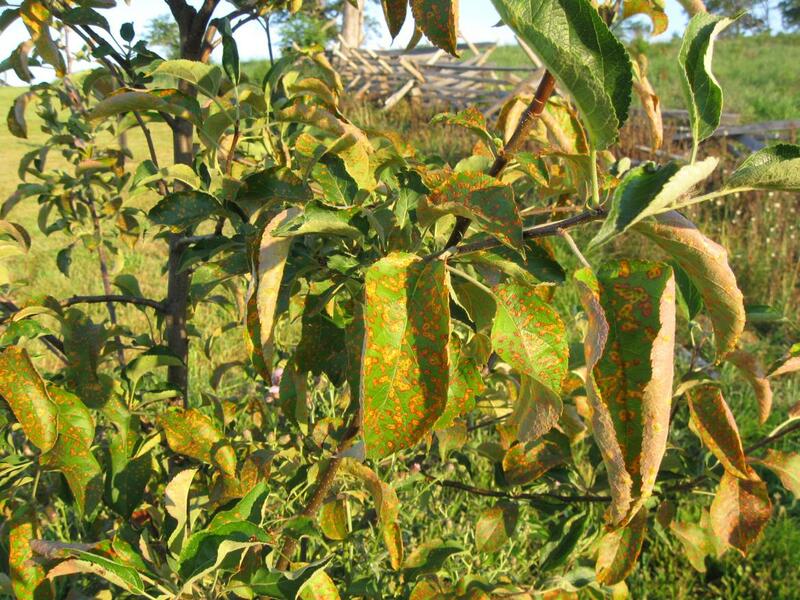 We’re not tree experts, but a few of the trees in this orchard looked like they were having some trouble. 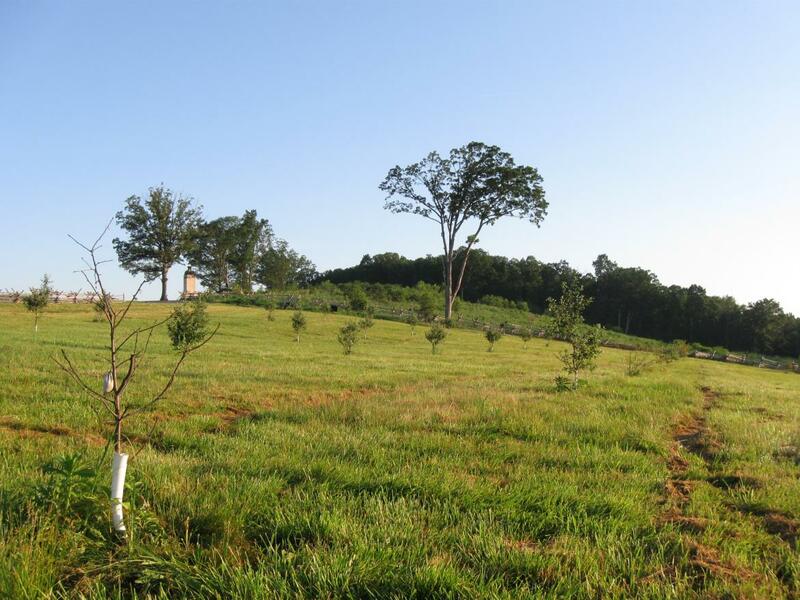 The bags on these fruit trees are filled with deer urine to keep deer from eating the trees before they reach maturity … This view was taken facing northwest at approximately 5:45 AM on Monday, June 21, 2010. … Obviously this tree has more problems than being consumed by mammals. This view was taken facing northwest at approximately 5:45 AM on Monday, June 21, 2010. This one in the foreground also seemed to have some trouble. With these exceptions, most of the trees appeared to be doing well. In the left background is the Eternal Light Peace Memorial. This view was taken facing north at approximately 5:45 AM on Monday, June 21, 2010. 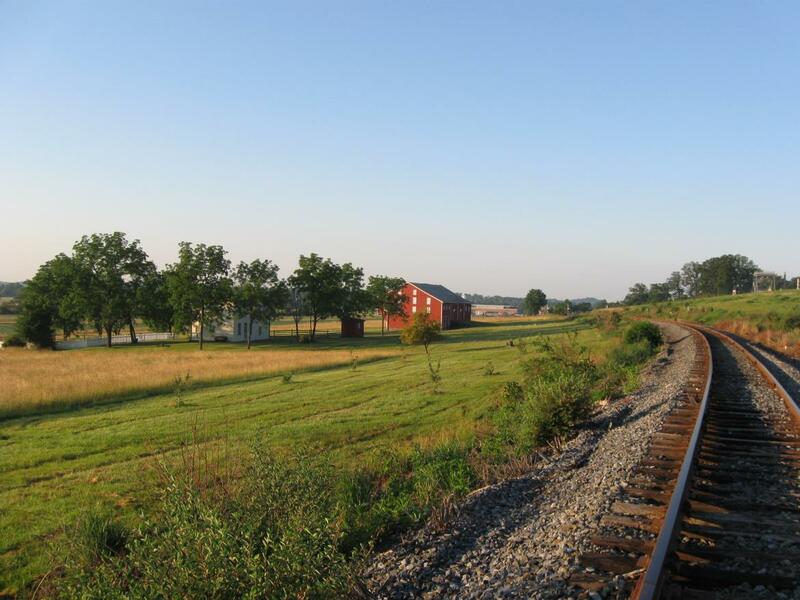 These railroad tracks for the Gettysburg-Harrisburg Railroad were not here at the time of the battle. They were constructed in the 1880s for the veterans and thousands of other individuals flocking to Gettysburg as monuments were dedicated on the battlefield. A few trees have been planted on this side of the tracks. This view was taken facing south at approximately 5:45 AM on Monday, June 21, 2010. We are now on Doubleday Avenue looking towards Sheads’ Woods. This view was taken facing south at approximately 5:45 AM on Monday, June 21, 2010. 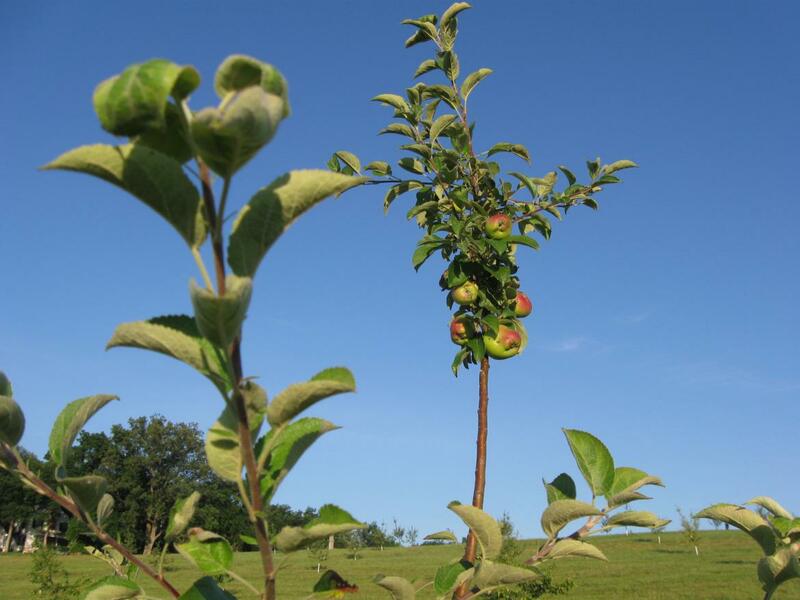 This orchard likely belonged to either the Heagy family, the McClean family, or the Forney family. 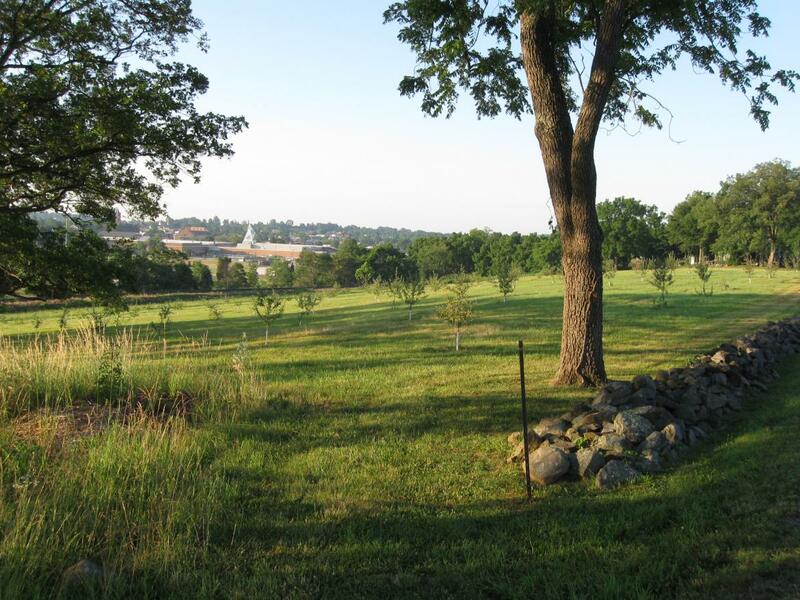 Cemetery Hill is in the left background above the new gym at Gettysburg College. This view was taken facing southeast at approximately 5:45 AM on Monday, June 21, 2010. 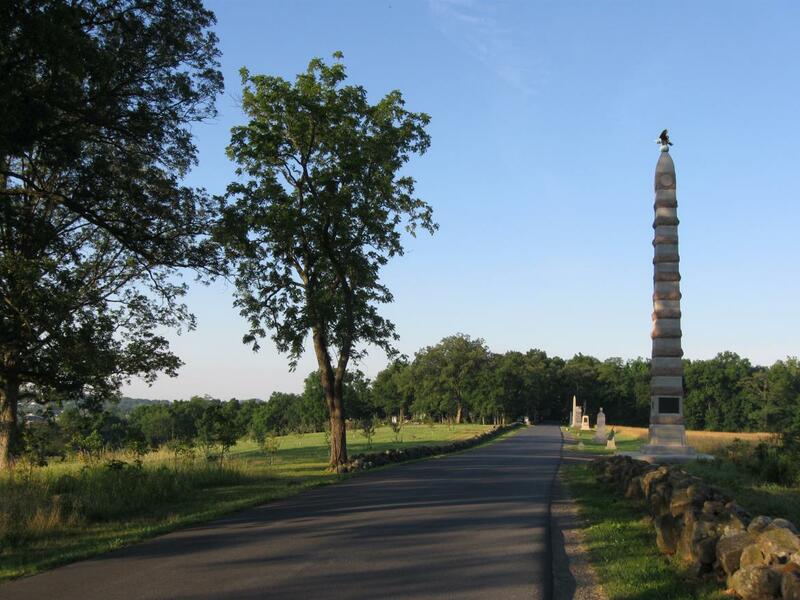 The monuments along the road are to Baxter’s and Paul’s brigades. 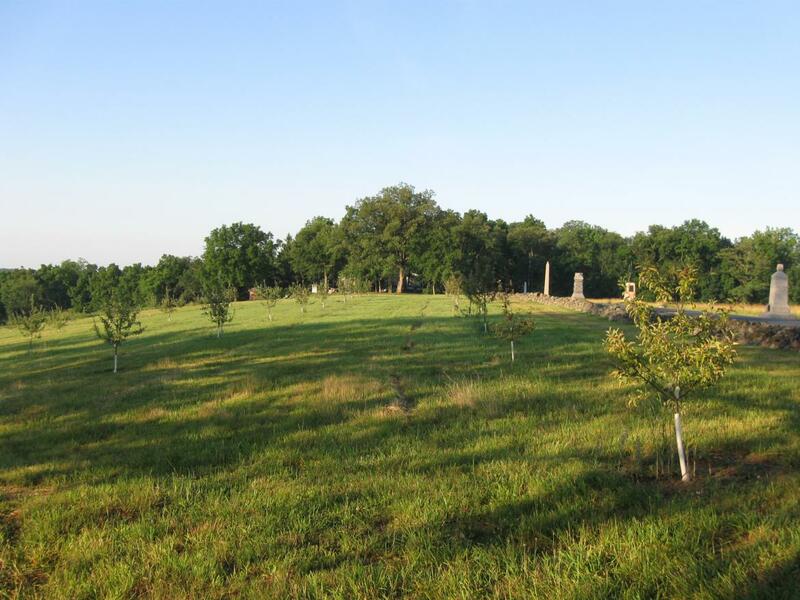 The Union soldiers were facing from left to right with Confederates attacking from right to left in this area. This view was taken facing south at approximately 5:45 AM on Monday, June 21, 2010. 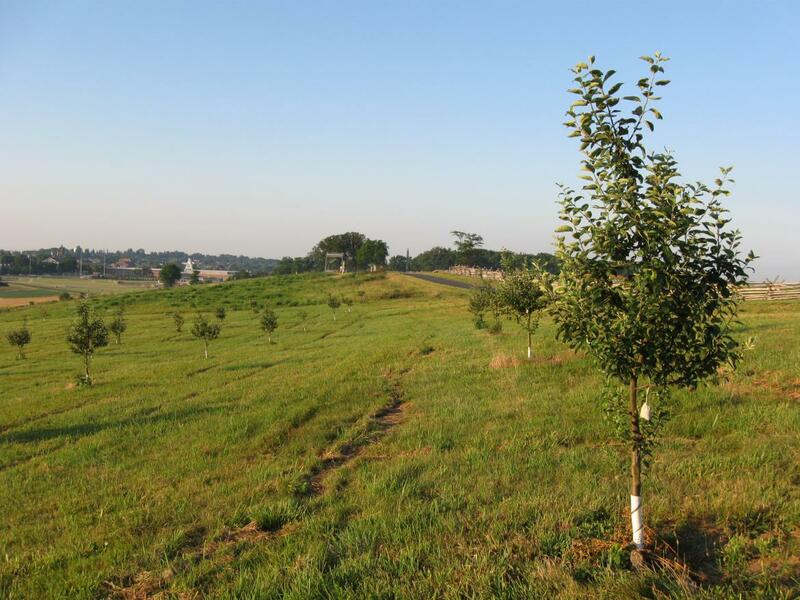 These trees in this orchard seemed to be faring better than those on the north side of the Mummasburg Road. This view was taken facing southeast at approximately 5:45 AM on Monday, June 21, 2010. The Doubleday Inn is hidden by the trees in the right background. This view was taken facing south at approximately 5:45 AM on Monday, June 21, 2010. 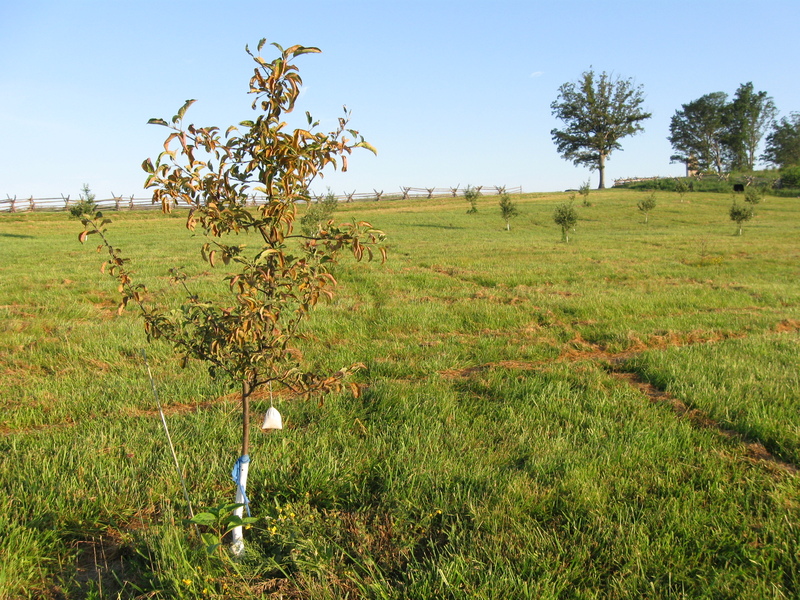 The Park Service is currently planting fruit-bearing trees in some orchards, but not in others (like Sherfy’s Peach Orchard on the Emmitsburg Road). This view was taken facing northwest at approximately 5:45 AM on Monday, June 21, 2010.